"Earn more money with better planning"
Having the right mix of varieties and colors available in due time is a challenge for many pot plant growers. For this reason Horti Advice decided to design a planning program particularly for this group. After several years of developing, using the best knowledge and experience from pot plant growers, they introduced GreenPlan. 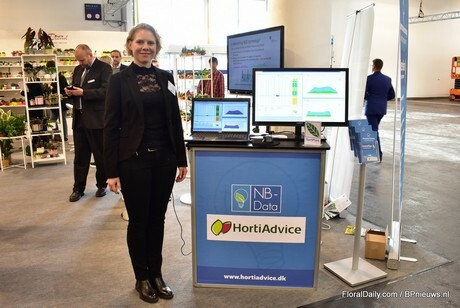 At the IPM Essen that took place last month in Germany, the software was presented. Charlotte Holde at the IPM Essen. 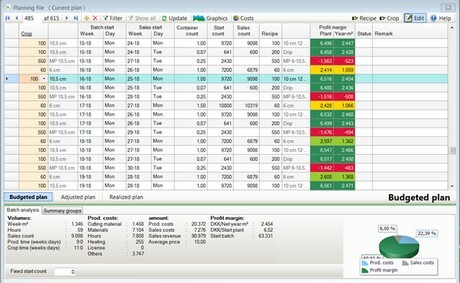 "With GreenPlan you can manage your production planning and economic forecast, because GreenPlan brings you a budget of the costs and income on a timeframe, that gives a financial overview for each crop - and also the overall production", explains Charlotte Holde of HortiAdvice. "Also, with Greenplan, a grower has the basic info to their Enterprise Resource Plan (ERP) and for the daily production management", Charlotte adds. GreenPlan is highly focused on precise timing of sale and has a number of features making it easy to assure that the right mix of varieties and colors will be available in due time. 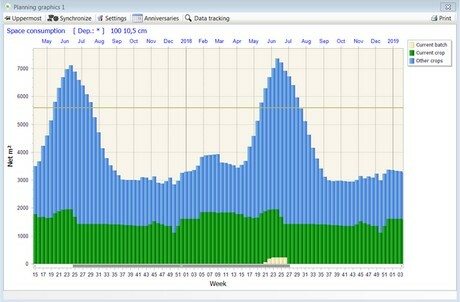 "GreenPlan makes it immediately visible for the planner, whether a production is a candidate for up scaling or down scaling." Overview of the production plan with profit margin for each batch, and in the bottom an overview over costs, amount and profit margin for the highlighted batch.